Expanded meeting of the Interior Ministry Board. 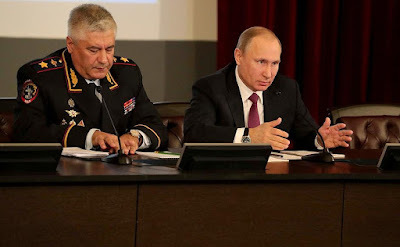 Putin.BLOG Police Expanded meeting of the Interior Ministry Board. 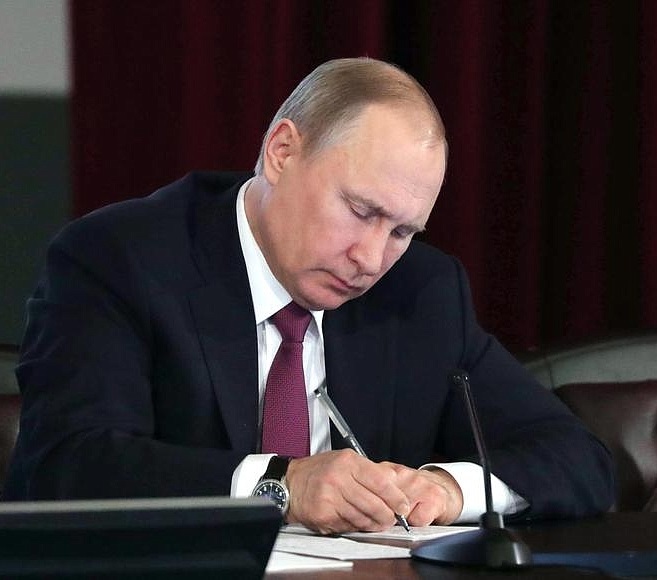 Vladimir Putin signing documents. Expanded meeting of Interior Ministry Board. The meeting reviewed the Ministry’s results in its main areas of work in 2016 and outlined the tasks and objectives for 2017. The keynote address at the Board meeting was delivered by Interior Minister Vladimir Kolokoltsev. As usual, this expanded board meeting will review the Interior Ministry’s results for 2016 and examine the priority tasks ahead, taking into account too the new draft of the Interior Ministry Regulations. The new regulations give the ministry a number of powers that were previously the responsibility of other agencies, such as the Federal Migration Service and the Federal Drug Control Service. You also have the task ahead of formulating state policy on road safety. Looking at the results, the decrease in the number of serious and very serious crimes continued in 2016, as did the number of road accidents, and there were improvements in preventive work with minors. This is all the result of serious effort on the part of local police officers, criminal investigations personnel, traffic police, and those working in other departments. It was also the result of more effective coordination between the Interior Ministry and the other law enforcement agencies and other government agencies. But as before, nearly half of all crimes committed remain unsolved. The ministry is not using its potential in full measure, including in sensitive areas of public importance such as combatting corruption, and protecting people, their property and their businesses from crime. In this context, I call your attention to the following priority tasks. The biggest priority is to ensure people’s safety and public order and reduce the number of crimes committed in public places. We see that there have been improvements, but we cannot rest on our laurels. On the contrary, continued effort is needed to consolidate these positive results. People must feel safe in the streets and in their homes, and must be sure that the police will come immediately to their aid if needed. In your efforts to bolster public order, you should work closely with the National Guard and public and volunteer organisations, and make wider use of modern equipment and technology. You must continue developing preventive work. You know that a federal law in this area was passed last summer, and the next step is to establish a system to monitor preventive measures taken, and develop coordinated mechanisms for collecting and processing information. Together, these steps will make it possible for the police to keep constant watch on people from risk groups, but even more importantly, to help those who really want to return to normal life. I ask you never to forget this. Preventing extremism is another priority task. Together with your colleagues from the law enforcement and security agencies, the Interior Ministry must be more active in using effective work methods, putting a stop to extremist acts, propaganda of violence, xenophobia and nationalism, and prevent attempts to lure young people into this kind of destructive activity. You must also work more actively with those who have links to international terrorist organisations. We keep coming back to this issue all the time. I ask you, as before, to be tough and uncompromising in your work. Extremists and radicals are making ever greater use of social networks and the internet to pursue their aims. A new threat I want to mention separately has emerged in the information environment, namely, the spread of sites that encourage suicide. These criminals – there’s no other name for them, or rather, if this were not a public occasion, one could find other names for them, but at the very least, they are criminals – prey above all on teenagers and youth, on children whose mental and emotional state can be easily shaken, or who are in difficult situations in life. In this respect, I support the State Duma deputies’ initiative to make an addition to the law introducing criminal liability for inciting others to commit suicide. This will make it possible to bring charges against those who own, create and run such sites and to stop what I stress is their criminal activity. It is essential to keep bringing down the number of road accidents and road deaths. This requires you to use new safety technology and modern equipment for detecting violations, and of course, you need to enhance your cooperation mechanisms with the Emergency Situations Ministry, Healthcare Ministry and other agencies. The force of the law alone is not enough to prevent aggressive behaviour on the roads and situations that endanger lives. This requires a principled stand by the whole of society. I therefore ask you to develop more active partnerships with volunteer groups, public organisations and citizen activists. This concerns not just order on the roads, but also crime and corruption prevention, work with people who could be drawn into crime, and other serious and important issues. As I said before, the Interior Ministry has been given important powers in the area of regulating migration processes. 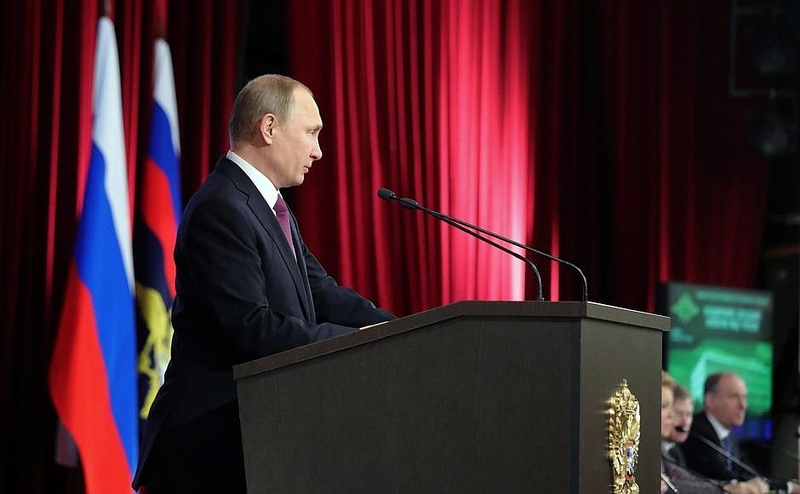 We are putting in place a civilised and transparent environment for those who wish to live and work in Russia, respecting our laws, culture and traditions, of course. At the same time, you must resolutely shut down illegal migration channels and prevent all violations of migration legislation. You should develop cooperation with our partners in the Eurasian Union and, of course, with other countries in the broadest sense, and develop the system of information resources in order to monitor the situation and take preventive measures. In conclusion, let me say a few words on personnel policy and the requirements to candidates for key positions in the Interior Ministry system. A number of senior Interior Ministry officials were arrested last year on suspicion of serious crimes. These cases dealt a serious blow to the Interior Ministry’s public image and cast a shadow on everyone who is carrying out their duties honestly and professionally. You must analyse thoroughly the reasons for these incidents, draw the necessary conclusions and give more attention to strengthening professional discipline among the ministry’s personnel. Even tougher requirements should apply to those who seek senior positions in the ministry. I count here on the ministry’s internal security department too, of course. I am sure that you will make the full effort to resolve these tasks. Let me thank you all for your work last year and wish you success in 2017. Concluding this part of our work, I would like to draw attention to the following points. They were already mentioned, but I will nonetheless add a few words. There are results, of course, and we see them. They are reflected not only in the statistics, but also in what is actually happening on the streets and in public places. The crime rate is really coming down, and this is the result of the Interior Ministry personnel’s concrete work. The road toll has dropped significantly, by a third. Our road toll used to reach as many as 30,000 deaths in some years, but in 2016, it was 20,300 people. I want to thank everyone who worked to reduce this tragic and sad statistic, and I ask you to please continue this work. More than 20,000 deaths – this is still too many, far too many. The same goes for work with minors. Yes, juvenile crime has come down noticeably, by more than 13 percent, but we know the full significance of juvenile crime. This is very, very important because it concerns the future of those who will carry this burden through their lives. Regarding serious crimes too, you must continue your work to keep reducing them. We carried out some serious reorganisation last year. The interior troops were separated from the Interior Ministry and reorganised as the National Guard. You have gained new powers, as I mentioned in my opening remarks, and the Minister said before. I had the chance to discuss many issues, above all work matters, in an informal setting at the end of last week and over the weekend. I want to say again that these transformations were an essentially painless process for the areas of work concerned, and this is to the credit of the heads and personnel of the relevant departments and the ministry in general. As I said, I discussed these matters with Mr Kolokoltsev during the weekend, including work together with the National Guard. Yes, create a second force of interior troops. We do not need a second National Guard. What we need is the sort of good coordination that we always had. I see no reason why there should be any problems with this. As far as I know, there are no problems, and I hope that this will remain the case. The same goes for work on combating drug trafficking, and migration. Yes, there are problems, as we have discussed, and we need to look at funding for detention centres for those who violate our laws. It is essential that the reorganisation efforts undertaken result in synergy. With regard to drug trafficking, the Interior Ministry system worked on this before, and we decided that this work would be more effective if everything is in the hands of one ministry. The same is true of the former Federal Migration Service and of migration policy in general. You worked closely with the Migration Service before, but without the Interior Ministry’s support, the Migration Service’s work was practically impossible. Now, this work is in the hands of a single ministry. I hope that this work will become more effective. This is a very sensitive area for our people. It has an economic dimension, and it is very important in terms of ensuring respect for our law and respect for our people’s interests, above all, our citizens’ interests. 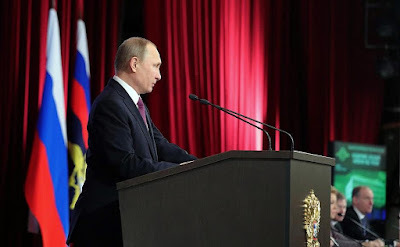 We must think about this, but we must also respect the lawful rights and interests of people who want to live and work in Russia, but who have the obligation, as I said in my opening remarks, to respect our laws, traditions, and culture. I hope very much that the transformations carried out will improve the quality of your work. The Interior Ministry is the key ministry for fighting crime and ensuring law and order in the country in terms of the tasks and the work you do. This is a colossal amount of work, and you know this well. Your work and your results play a very big part in how people see the authorities in general. I want to thank you once more for last year’s results, and I hope that the Interior Ministry personnel will not stop here. I wish you good luck. Vladimir Putin with Valentina Matveenko. Expanded meeting of Interior Ministry Board. President Putin with Interior Minister Vladimir Kolokoltcev. 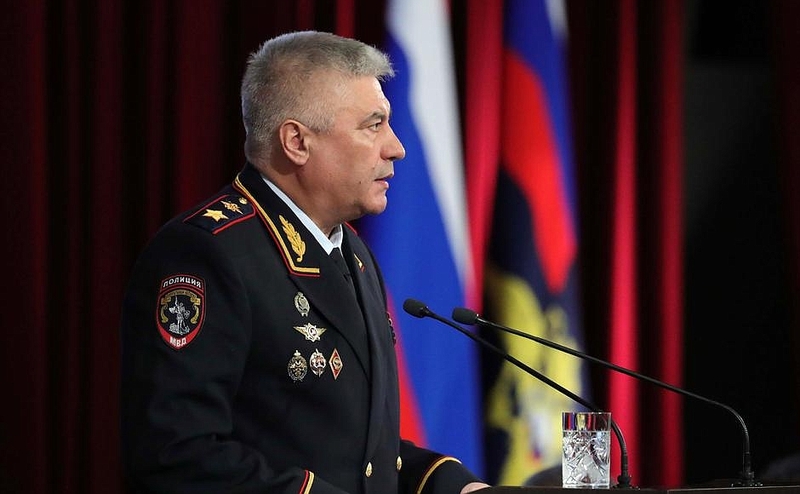 Interior Minister Vladimir Kolokoltcev at the expanded meeting of Interior Ministry Board. 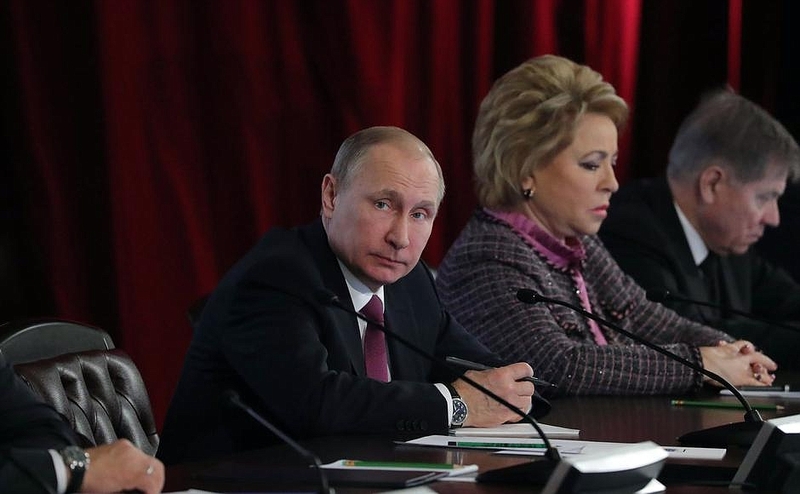 Russian President Vladimir Putin at the expanded meeting of Interior Ministry Board. 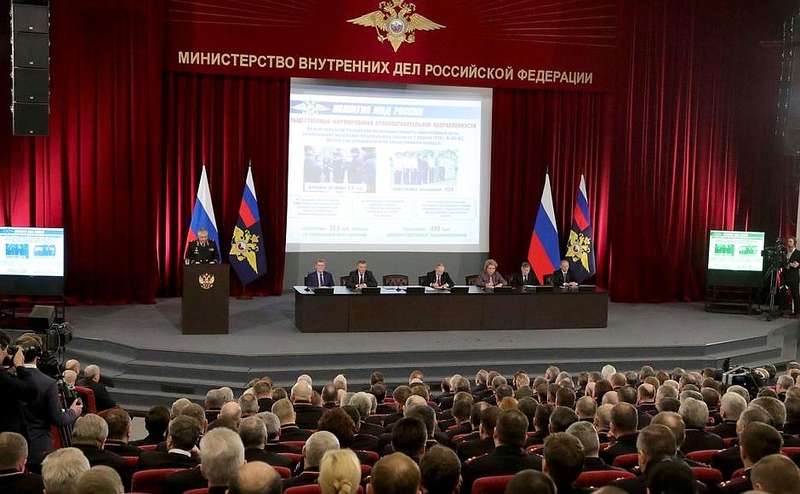 0 Comment to "Expanded meeting of the Interior Ministry Board."